Child, girl and woman, I've gardened. I know the pitfalls . So, in spring, I approach my mail box with trepidation. For, spring brings gardening catalogues. These purveyors of fantasy lure gardeners with pages of vibrant colour. There are tempting illusions of delectable-appearing vegetables and vivid flowers. Each page offers an implied promise that the reader can create a harmonious oasis of water, colour, leaf and loam, home to singing birds and friendly small animals. Such dreams of paradise have sparked religious fervor through the ages. Gardeners , too , are motivated by faith and hope. We truly believe that, THIS time, things will be different. This year tomatoe hornworms won't outnumber the tomatoes; slugs, (where do slugs come from in the dry Interior? ), will not render the bushy astilbe a skeletal wraith; small green worms won't descend from nowhere and, in twenty minutes, decimate the columbine; and the war against goutweed will be won. Usually such happy events don't occur. Every year goutweed extends its territory, encircling asters and oriental poppies. Slugs send invitations to their kin to join them, till I'm convinced there are slug shuttles arriving daily from the coast. Green worms continue their depredations. The gopher tussle goes either way as gophers open up new diggings and gardeners pounce on them. Like a battle in a front-line village, sometimes the gophers advance; sometimes the gardener prevails, pushing them back into the hills. Now, gardening magazines, like other religious tracts, admit there's a dark side, and include hints for outwitting garden 'pests'. Encouraged that we are not alone, that we have allies in Comox and Kimberley, nay even in Calgary, grim fellow gardeners willing to share their 'pest' antidotes, we soldier on. We may not win, but at least we're in good company. Though, considering some of the suggested remedies, I'm convinced a few of these folks have been out too long without a sun hat. Who first proposed that the best way to destroy slugs is to ply them with beer? Sounds like the dubious recommendation of a gardener who's given up and is having a few to console himself. That, or we're faced with a small, slow, but shrewd , bibulous gastropod. There's a frightening thought. None of this matters to the addicted gardener and the industry knows it. Pictures of flowers and shrubs, all in perfect condition, most of them unobtainable at any garden shop I frequent, tempt me to buy them. I disregard my yard's north-facing slope, constant sun and limited space available for experiments. "Share, darn you, share!" I insist , pushing the new wegelia between the resident clematis and golden elder. On the surface the plants feign friendship but a nasty struggle for dominance goes on between the root systems. In my yearning for exotics, I ignore the fact that the most successful plants I have are volunteers. The white lilac, cramped in its original yard, sent suckers under the fence and is now a handsome tree in mine. English ivy, a ground cover I always coveted, discovered that a few boards were no barrier to its creeping tendrils. I suspect that it's taking over the neighbourhood, one yard at a time, held in check only by goutweed. 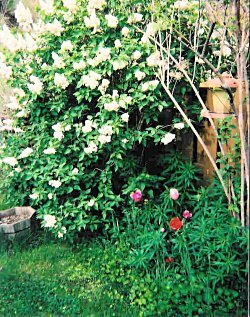 At the back of the yard, remnant wild roses flourish, blending the yard with the wild hills. Hardy, all of them. But, oh, the charm of those new plants, featured on page fifty-four! There's worse to come. Once the budding gardener shows signs of being truly caught; can't pass a seed rack without clutching packages of plants he'd never eat, chard, bok-choy; keeps a garden journal; sketches plans for next year; the garden industry ups the ante. It's time to get that gardener hooked on the hard stuff. Yes, I mean garden tools. Why, my own favourite garden magazine slyly included with its spring issue an introductory catalogue from an upscale garden tool supplier. Not a complete catalogue. Nope. Just a sample, enough to tantalize. To make the recipient wonder, "If there are so many treasures in fifty pages, what delights must await me in the regular book?" Does it work? Just ask me. These, you see, aren't ordinary garden tools. No sir. They are forged by master smiths, following blue prints from structural engineers. The metal, one infers, was mined by dwarves, from deposits protected since Toledo was a by-word for superb steel. Just the descriptions leave one salivating, filled with a yearning which can be appeased only by buying one or all of the items. only $l00.00 plus taxes and shipping, I'd be the smug owner of the supreme sprinkler and could at least sit and admire it when it's not my turn to water, sprinkling being restricted here. Nor is it the only ingenious watering device. 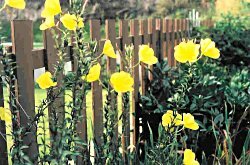 There are sprinklers mounted on fences - what a surprise for the unwary neighbour, bending over to trim her potentilla-, aqua- spikes on which a bottle of water can be mounted to trickle into the soil, and a rain barrel to catch water, should any fall from our drought-ridden skies. What imagination enlivens this mundane task. No less ingenuity is given to weeding, that detestable chore. A water-powered weeder, a weed torch, dandelion diggers, all combine to ensure that none of the yellow menace defaces the perfect lawn. But, for sheer covetousness, nothing matches my feelings as I gaze at the pruners. Swiss made, and we know what sticklers the Swiss are. Surely the life of the most hapless gardener would be joyous if she used these professional tools? A dominant fantasy dispensed by the gardening trade is organization, every tree and shrub placidly in its place. Naturally gardeners are lured by the dream of imposing order on even a small piece of an increasingly chaotic world. Alas, it doesn't always go as planned. 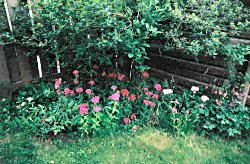 Certainly I know of tidy flower beds, regimented vegetable plots, every plant an exact distance from the next , growing only to a specific height. They're an example to us all that those picture in magazines have some basis in reality. pruning them. They sulked. They refused to bloom. Two year's neglect and they are almost back to their lush selves. The day my latest garden magazine arrived it was 25 below, counting the wind chill. Gullible tulips which had trusted the signs of spring, were 3" high frozen green spears. Twenty-four hours later they'd disappeared under several inches of fresh snow. I mourned them as lost. and hope that others will love them as we do.